So I bought a couple of pears last week and usually they take a couple of days before they get ripe enough for me to be able to eat them on their own. But it had been EIGHT days already and the pears were both still hard as a rock. So weird. But I really wanted to eat those suckers. That, paired (see what I did there? Play on words) with the fact that I was only really comfortable with either a napping position or a standing position, I opted to take the standing position and whip up some sort of baked good that included these pesky pears. 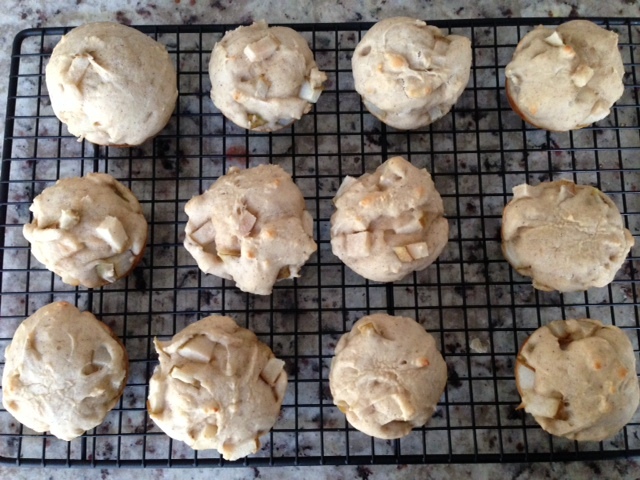 I recently saw a post for Pear and Applesauce Muffins (recipe can be found here) but decided to change it up a bit based on the ingredients I already had. The result? A SUPER tasty, dense muffin. PS: Some people are strictly light-and-airy muffin goers. If that’s you, I’d stay away from my recipe, but maybe give the one linked above a go. If you can handle a more dense and hearty muffin, give this one a whirl. 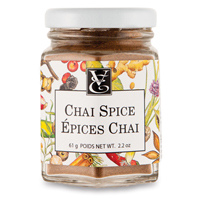 I opted to use chai spice as I bought a jar of it from Epicure about 2 years ago and have only used it once since! If this isn’t available to you, go ahead and use apple pie spice. Or cinnamon. But chai is really such a unique flavor that I highly recommend picking some up if you ever see it in stores! 2. Add butter, sugar, applesauce, eggs and vanilla to a large bowl and use a beater to thoroughly combine. Add salt, baking powder and chai spice. Combine. Slowly add flour to mixture. 3. Fold in diced pear (cut into about 1/4 in pieces). 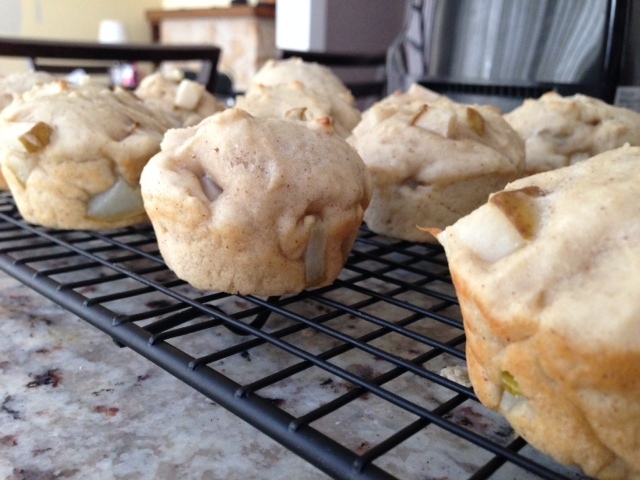 Spoon mixture into muffin tins and bake for about 15 minutes or until tops of muffins ‘bounce’ back to the touch. Allow to cool on wire racks immediately after removing from the oven. 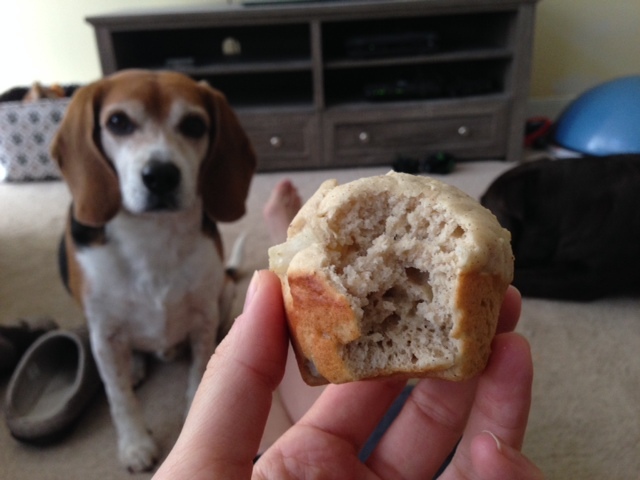 Do not eat on the floor in front of your beagle. Beagles will beg. Anyone use chai spice? Got a good recipe? I’d love some recommendations so I can use up my jar! I like the idea of chai spiced muffins! I would try this with apples because i’m not a fan of pears. I’m not sure if I’m a fan of chai. I really “WANT” to like it, but it makes me feel like I’m eating/drinking perfume. Yum. I love chai! I need to try those and get that spice!! Jen, these look so yummy!